RICHLAND, N.Y. — Black horse-drawn buggies were parked outside a wooden house where Amish people were crowded inside — laughter and the smell of food spilled out of the front door Saturday afternoon. When Levi Swartzentruber came to the door though, his green eyes watered at the mention of his 6-year-old son Jonathan L. Swartzentruber. He died after being hit by an SUV across the street from his home Friday. State Police in Pulaski said the boy was chasing his windblown hat across county Route 2 when a man driving a 2002 Dodge Durango hit him. This is the second death of a child in the area in the past few days. On Tuesday, a 13-year-old boy was killed while sledding down his family farm lane into the road. Though it sounds like neither driver was at fault (both tried to avoid the children), I took these stories as another reminder when driving through Amish communities: it’s not just the buggies or scooters to be aware of. Amish communities are full of Amish children. Even though they’re taught to be careful around the road, children are children and accidents will happen. Thoughts and prayers for the families. Amish children image: Ed C.
That is so sad. But we know God makes no mistakes. I feel for the family, but also for the driver who accidentally hit the boy. My heart felt condolences to the families. The article tells us of a youg Amish boy killed while running into the street for his hat. Ok. we know that. Then here you come by and tall us your sorrowful story is it aLL ABOUT YOU NOW? Don’t be too quick to misread empathy as self-centeredness. Just because someone shows that he can relate to a situation doesn’t mean that he thinks it’s all about him. Myself, I see nothing wrong in what Slightly posted. Whoa. That is quite a strong response to a comment from someone who expresses heart felt condolences, rose. You have me scratching my head. Yes, IMO at this web site we don’t intend to make it about us but instesd we try to understand a culture that is far more advanced or perhaps far more reversed than our modern society. Many of us relish in a society that is not about “us” but rather about a simple life that honors and respects a way of life and a way of living that just doesn’t recognize the 21st century modern thinking in favor of a more pure and simple 18th century mind of thinking. It’s the real deal when we admire a society that lives by a philosophy that honors basic Biblical teachings. I’m thinking of the very basic “Do unto others as you would have them do unto you”. The sayings of the Amish are rules to live by and most of them are the same things our parents said to us. “If you can’t say anything nice, it’s better to say nothing at all”. Hey Erik, that might be a whole new thread. It certainly wouldn’t hurt. Amish sayings……..Rules to live by….Perhaps we all might need a refresher. I forgot one quote that I incurred last fall. An Amish lady presented me with a homemade pumpkin pie in a pyrex plate. I told her that I might not be able to return the plate very soon since her farm side vegetable stand was closing for the year and I would have no reason to return soon. She replied “No hurry…No worry”. I loved that and I think of it everyday. What a wonderful way to live your life. “No hurry…No worry”. Think about it. Not a bad idea Jerry. I know our recent posts on the “1001 Questions and Answers on the Christian Life” got a good response, and I think that is along similar lines. I like “no hurry no worry”. If you’ve got some other ideas feel free to drop me an email. Such a sad thing. Praying for the family. My 4 year old granddaughter was run over and killed. It is not something that you ever get over. God gives you the mercy and grace to carry on. We were just up in that area a couple of days after Christmas. We met some of the people and purchased some items. I was wondering where the Amish bury their dead? I don’t remember seeing any cemeteries there or in Lancaster. Our personal experiences help us to relate to the situations we deal with every day. No, it’s not all about us but how our experiences help us to relate to current events. It’s our life experiences that make us who we are. No disrespect intended. Such difficult days for these families…. One of my cousins died in a similar accident when I has a child, and I remember the devastating grief. While I believe everything happens in God’s timing, that doesn’t lessen the pain. Praying for these families–the ones that lost a child, and the ones driving the cars. This is so sad. My thoughts and prayers are with this family. Our hearts go out to all involved — the family of the child, the driver, and even the first responders who must deal with tragic situations like this. Whether an instance like this is the outcome of God’s divine will or just a person’s poor choice which He allows, we rest assured that in all deaths of His children, this in His eyes is weighty and not ignored or taken lightly. One thing that regularly strikes me in observing the Amish is how similar we are once you get past the obvious-but-shallow exterior differences. With two grandkids of my own visiting with us right now, I can see how easily it could happen to us, but I suppose that with larger number of children the odds of it happening are a bit higher for an Amish family. When I was 12, an eight year old play mate was killed by a car as he was chasing a ball across a roadway. It sadden me then and still saddens me today. It happens but how do we explain it. It was an accident. No less the sorrow. My prayers are with the child and the family tonight. If I could only reverse this accident, I surely would. May God bless the family. I can not process the loss. Tonight, my heart bleeds for the family. I’m so sorry. There is nothing Biblical that can help in this situation. It’s just awful. Jerry, I don’t mean to make this into a theological debate. I have never lost a child, although there were times I wasn’t so sure but what some respiratory issues might take one of ours. But I have lost my father due to cancer. And I can say with 100% confidence that in both of these difficult situations that it was in fact something Biblical that saw me through it all. Sometimes the truths of God’s Word calms the storm around His child; something it just calms the storm within His child. Both either way, it is the truth found God’s Word and lived out in the live of His child that makes the difference. Many years ago I attended an Amish auction in a very remote area in Pa. I think it was for the Jacks Mountain schools. I bought a printed history book of deaths in the “Big Valley”, up near State College. 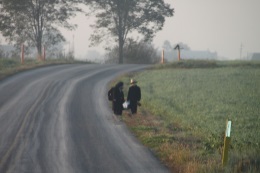 The “Big Valley” is the home of a large Amish population that includes three different churches. It’s very famous and very little visited. I know the book is somewhere in this house and when I locate it I will make an attempt to share a few pages with our host and perhaps he will publish some of the pages. In the book it lists the deaths of several children who died in a variety of accidents. It shows that deaths like this have been going on for years and none is less tradgic than this one. I’m so sorry for these people and my prayers are with all of them tonight. I live in Central Pa. Lancaster county is just one county away. This past year, I have often heard about Amish buggies and automobile crashes. It seems to happen every other month this past year. It’s very sad when you read about a peaceful people suffer loss of children at the hands of “modern society”. Sometimes the two collide and the end result is never a pleasant one for the Amish. The losses are awful and sometimes it makes you wonder how these people can go on. Accidents happen but they are so sad for these families who just wish to exist with the old ways and then they clash with modern situations. I truly believe a lot of collisions between a gas driven vehicle and a Amish buggy powered by the strength of a horse is not always accidental. We know this in our own society when road rage occurs. It could be considered as road rage when an aggravated car/truck driver is behind a buggy and they are on a 2 lane roadway with no dotted lines but instead have 2 straight yellow lines painted meaning no passing. The irate, irritable car driver many times creeps up too close to the buggy scaring the horse and in winter will cause a skid to occur when applying his brakes. Theres no need to creep up on any buggy when ever you see one. It is against the law and is known as tail gating. The same goes for driving behind a motorcycle. Leave two car lengths behind the buggy and yourself. I did want to point out an interesting cultural custom. Did you notice the lad’s middle initial is that of his father’s first name? Amish give their children – both male & female – no middle name but the first initial of the father. I learned this when our ex-Amish son-in-love joined our family. He’s the baby of 12 and all his sibs have the same middle initial 🙂 He explained that’s how they identify a child when there are such large families and many of the same names are recycled. In our community, many people have middle names. Our children’s middle initials are all different because they each have middle names. In many Amish communities, the mother’s maiden name initial is used as the child’s initial. So Jacob B. Yoder has “B.” because his mother was a Beiler. If I remember right Brenda, your son-in-law was Swartzentruber, right? I can see they wouldn’t do middle names. On the other hand, Swartzentruber folks then don’t often have to ask how the new baby’s name is spelled. 🙂 We see some pretty far out names in some Amish groups. Hi Mark in Holmes, I’m in Knox 🙂 And you’re correct in that our SIL and our “adopted” ex-Amish sons are all Swartzies. Good memory. Hmm, must be a Swartzie thing with only father’s middle initial. First, I want to elaborate a tad on my above comment, ^ often things ARE God’s will. But sometimes, when people have buggy accidents due to no safety features (Swartzies), they’ll attribute it to “God’s will” when I see it as perhaps testing God by not using safety features. Second, Mark, I read that your OOA. May I ask purely out of curiosity – not condemnation – do you use the pc at work? I wonder, too, if you & I have some mutual friends. The initial from the father’s name is not just limited to Swartzentrubers, but as far as I know is the only way they do it, where in the OO it is more common to have a middle name. I wondered what you meant about God’s will… but I agree about things like buggy safety. We don’t have a lot of Swartzie Amish right around here (Berlin) but enough to see them on the road now & then. It always seems to me that their way of having their buggies is almost “asking” for an accident. The PC at work… I think I wrote about that earlier this week in a lot of detail. (I’m too lazy to repeat it all) but in the last few posts there should be that answer. In a few words yes, I do use it at work. For Lancaster County I believe the middle initial is the first letter of the mother’s maiden name.